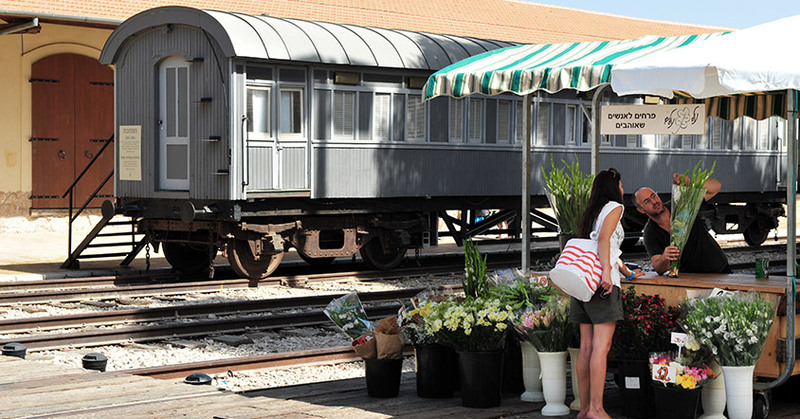 HaTachana, (in Hebrew: the station), built more than a century ago in 1892 was the site of the first train station ever built in the Middle East. In its early years, the 55 kilometer ride from Old Jaffa to Jerusalem, took 6 hours but still proved quicker than camel and cart! In 1948, the station closed and was left for ruin until its recent renovation as a culture & entertainment complex. HaTachana & its 22 Ottoman era buildings sits on the border of Jaffa & Neve Tzedek so guests staying at The Norman can enjoy a gorgeous stroll down Rothschild Boulevard and then through Neve Tzedek to reach it. HaTachna has been renovated & transformed into a complex of independent shops and restaurants with a strong nod to its heritage and a jumble of refurbished rail cars, freight terminals and train tracks. Every Saturday there is a free open air circus performance for the delight of children and playful adults. The shows include acrobatics, fire dancing, clowns, jugglers, street musicians and living statues, (each performance runs for around 30 minutes). 9 restaurants, plenty of shops, temporary art exhibitions and live performances…you’ll be hard pushed to get bored here! HaTachana is open 10am to10pm daily.